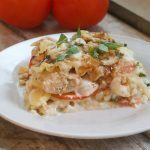 Creamy Chicken Caprese Lasagna. An Italian meal your whole family will love. Cook lasagna noddles in boiling water for 7 minutes, they do not have to be cooked thoroughly as they will continue to cook in the oven. Drain and set aside. Start with a frying pan with two TBSP of olive oil, add chicken, salt and pepper and cook for 6 minutes. Next add balsamic vinegar, and stir in to evenly coat chicken. Add minced garlic and Italian seasoning. Cook for one minute. Remove from stovetop and set aside. To make the cream sauce, start with butter and cook until melted and bubbling, add flour, and stir. Gradually add milk and whisk. Cook over medium heat until sauce thickens. Remove from heat, whisk in shredded mozzarella and parmesan cheese. Add Salt and pepper to taste. In separate bowl, add ricotta cheese, egg, and salt and pepper, stir until combined. Assemble: Add a layer of sauce to 9×13 pan. Then add one layer of noodles, spread ricotta cheese over noodles. Add sliced tomatoes, fresh basil, chicken, and sprinkle 1/3 of the mozzarella pearls. Repeat two more times. Finish by topping off with remaining tomatoes, mozzarella pearls, and fresh basil. Cook at 375 for 30 minutes.